The weekend was productive. Although I am having the devil’s time with the yarn and getting gauge, I’ve managed to finish the back and front. Want to see the back? No, it doesn’t say nautical, but I think its say contemporary. While I like the feel of the yarn, and I love the stitch definition, I am not liking the gauge issues with this yarn. The yarn is Lima by Drops. A European yarn with a translation problem. The yarn band gives gauge as 21 sts and 28 rows = 4″ (10) cm on size 4 mm US 6 (British size 8) needles. I am not a loose knitter by any stretch of the imagination. When I was younger and still learning to knit I kept a small hammer by my side to tap the right needle through the stitch on the left needle. Yes, nothing says knitting like a little yarn, two needles and a hammer. Eventually, one of my grandmothers put me out of my misery and showed me how to knit a stitch that wouldn’t strangle the needle. I still have the little hammer, by the way. But back to the Drops yarn.The most I could get as gauge from a US size 6 needle was 18 sts. That was 3 sts less than the gauge on the yarn band and the gauge on the pattern. Usually, because I am a tight knitter, I have to “size up” to get gauge, using a larger needle than called for. Now I found myself in the strange position of having to “size down” the needle. I got gauge with a 3.75 mm US 5 (British size 9) needle. I’d like to say and that was that and everybody scampered into the woods and lived happily ever after. But not quite. I completed the back, adding 1″ (2.5) cm to the length to compensate for the intentionally rolled cast on edge that was making the sweater come in too short. Stitch definition looked great. The body looked a little wider than the 10.5″ (27) cm called for on the schematic, but hey, it’s a raglan and it’s striped. Stripes always make garments and the people wearing them look wider. It’s why I don’t wear them. Onto the front. I knitted it up to the neckline while the “optical illusion” of wideness ate away at me. Not able to stand it anymore I took my handy tape measure, ran it from one side of the sweater to the other and surprise, surprise, surprise! It’s 11″ (28) cm wide and not an optical illusion. My brain immediately jumps in with “but when you seam it up….” Nice attempt at delusion, but when I seam a garment I lose maybe a half inch (1.5) cm not a whole inch (2.5) cm. I checked my gauge again this time in various spots and viola the answer appeared. The stripes were not only alternating color, they were alternating in pattern too. 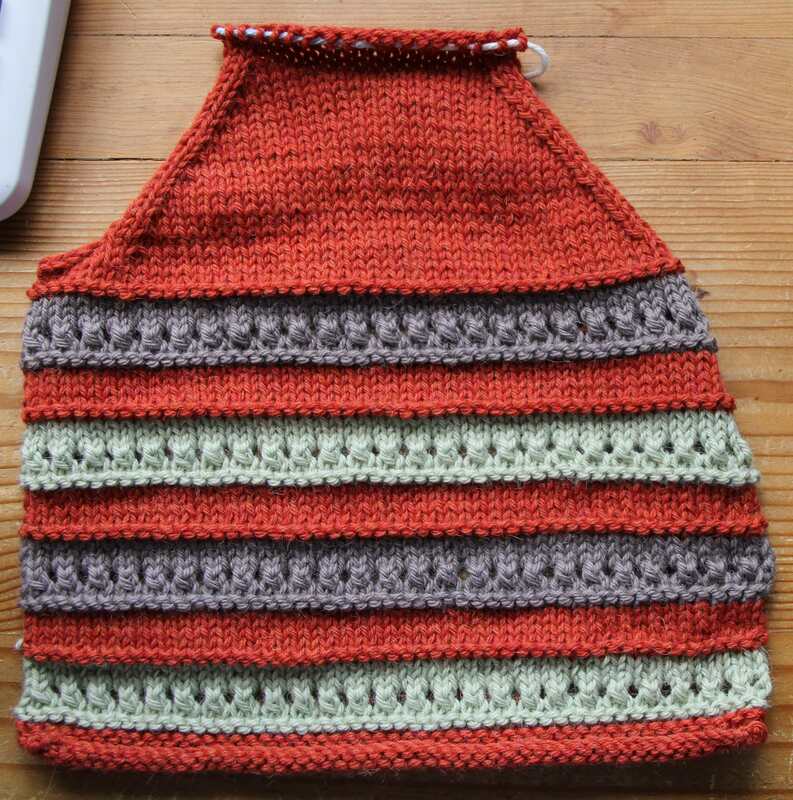 The main color stripe was knit in stockinette stitch. 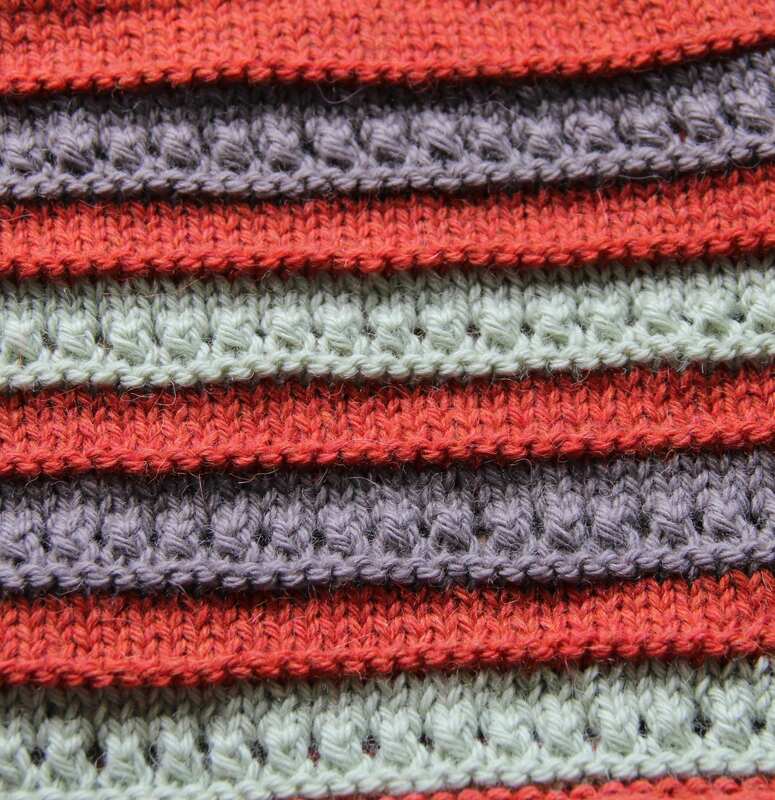 The contrasting color stripes were knit in a pattern that included yarn overs across the row. Even though the yarn over was immediately followed by a decrease, the decrease was such that it didn’t pull the fabric in. And so the patterned stripes had a bit more expansion width-wise than the stockinette stitch stripes. After mulling over a number of options, I decided to leave the anomaly in place. It is only an inch (1.5) cm and to try and off-set it would cause the sweater to become to small. Tonight I alter the front neck so the entire neckline becomes a funnel neck. Then I calculate and start knitting the sleeves. What could go wrong?